Congrats finalists! You all will receive a gift code for 20% off your next Verve order. Email us at info@vervestamps.com to claim your prize. After narrowing it down to those six, I had the hardest time picking a winner. 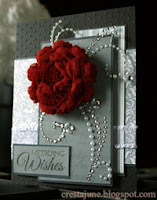 I've got a soft spot for big flowers, bling and shabby chic, so each one of these cards makes me a ltitle giddy. I finally decided to pick TWO winners. Both were finalists in last month's challenge and their recent uploads have been making me stop and stare. This card is just pure elegance. I love the classy color combo, the gorgeous flower for the pop of color and the fabulous bling. Other details like the subtle stamped background, sheer ribbon and swiss dots embossed card base are just icing on this scrumptious cake of a card. 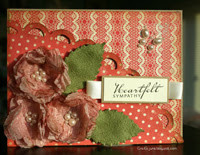 And this card from last month's challenge with these shabby flowers kept calling my name. Gorgeous! MelissaDH of My Paper Obsession! Melissa entered not one, but two cards in this month's challenge, and both were among my favorites. I love the modern, graphic feel of this scripture card. It has just the perfect amount of distressing and that bow and ribbon flower are spectactular. Her second card is all softness and beauty. I love the fabulous bow and the flawless way she pulled off both of these styles. Congrats Cresta and Melissa! Email me at info@vervestamps.com with your shipping information and I'll get back to you with details about our April release! Thanks to everyone who played along! If you didn't win this time, mark your calendars for the next Get Your Diva On Challenge... April 11! And tune in tomorrow for the first day of Spotlight Hops for our March release!